Gamescom 2016 kicked off this week on 17 August in Cologne, Germany. While there wasn't huge VR headlines, there were several dates doled out for upcoming VR games. A lot of big things were covered on the site as well including Intel jumping into the ring with mixed reality headset Project Alloy, pre-orders opening up for the new Samsung Gear VR and the Oculus Rift is finally heading to the UK and Canada. It's been some time that the older Gear VR's been out and a few months since Rift and Vive have been out so we tallied up the numbers to see what people are actually doing inside VR. And finally, it's back to Gamescom again as we tried out a new way to specatate VR experiences at a show floor booth. Read on for more VR news from the week. 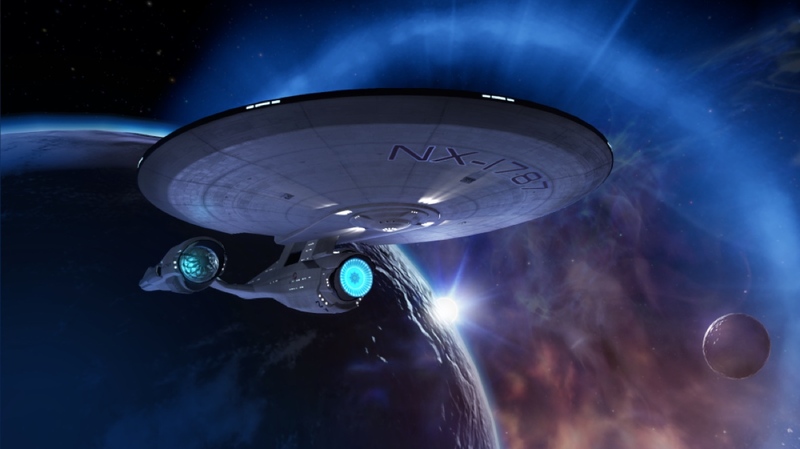 We were lucky enough to try out Ubisoft's Star Trek Bridge Crew VR game -where you fly the Enterprise with other players in VR - during E3, but didn't get any further details. Gamescom however, let loose the official date: 29 November for Oculus Rift, HTC Vive and PlayStation VR. Ubisoft's other big titles also received releases, with Eagle Flight landing on Rift on 18 October, PS VR on 8 November and 20 December for Vive. Lastly, Werewolves Within will be ready 8 November leaving you lots to look forward to. More games abound - Driveclub VR was teased awhile ago but PlayStation announced the title will be a PS VR exlusive though the exact launch date wasn't specified. There will be new VR game modes, tracks and ways to view the cars close up, all tailored for VR play. Hatsune Miku, the singing software sensation, will be available in her own game for PlayStation VR called Hatsune Miku: VR Future Live. Players can then use the Move controller to dance around then hang out with the character on stage. In typical Trey Parker and Matt Stone fashion, the promotion for the team's new South Park game involves a 'Nosulus Rift.' Basically, smell immersion. Oh, and farts. The gimmick isn't for sale and will only be available to try out during conventions. In other VR news of import outside Germany's Gamescom halls, it looks like HTC is trying to push VR into China's mainstream by partnering with Alibaba Cloud. Vuzix, the company behind the M100 smartglasses, has announced its integrated SteamVR on its iWear headphones which has greatly expanded the game library. Microsoft is also trying to put Windows 10 on other headsets including VR and mixed reality aside from HoloLens to let people use a virtual space to work from. And in other AR news, it sounds like Apple is working on something related to AR behind the scenes, if we're to believe Apple CEO Tim Cook (which we do). Wands is a game where you're a dueling magician and while it looks suspiciously similar to Insomniac Games' Unspoken title (where you're, again, a dueling magician), it may be more accessible since it's available now for Gear VR. And honestly, it looks just as fun. Graphics won't be Rift quality of course, but the spells and multiplayer aspect can still provide the same experience, in mobile form. Wands is out now through Oculus Home for the low price of $5.99. This VR trailer for Immersive Combat is meant to give you a taster for the new action series from Spherica VR. The studio is aiming for a dozen more live-action VR films for 2016 centered around various combat styles with champions for each one displaying their skills. All dressed up in different costumes from a variety of time periods of course. Fun!